The inaugural May Design Series took place at Excel earlier this week. The carefully edited show combined highlights of the existing shows Interiors UK, KBB and The Arc Show with a brand new event called DX which presented a hand-picked selection of cutting edge products and ideas for the interiors market, along with a round up of some of the best new products from the European show season. More industry focused than some other events in the London design calendar, the show was primarily targeted at interior design professionals and architects along with the property and retail communities. And it definitely seems to have identified a gap in the market and come up with a fresh and unique new concept. DX Freight made an immediate impact as you entered the show, featuring highlights from the Paris, Stockholm and Cologne design shows presented in plywood 'shipping containers'. 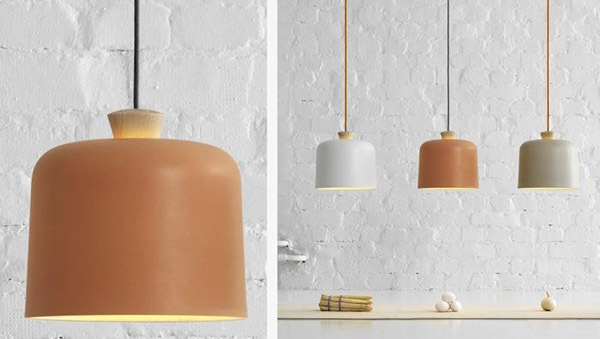 Designs featured included these Fuse pendant lights by Note Design Studio. Also at DX Freight, Brazilian designer Jader Almeira's award winning Euvira chair is a contemporary take on the traditional rocking chair. Armrests and base runners taper in the middle to create an elegant and flowing impression while the cord seat and backrest appear light and transparent. A masterful blend of lightness and solidity it's available from Aram. With a heritage that stretches back to the 19th century Adamsez is one of the UK's oldest bathroom manufacturers, and one of the few remaining companies who still design and make in the UK. 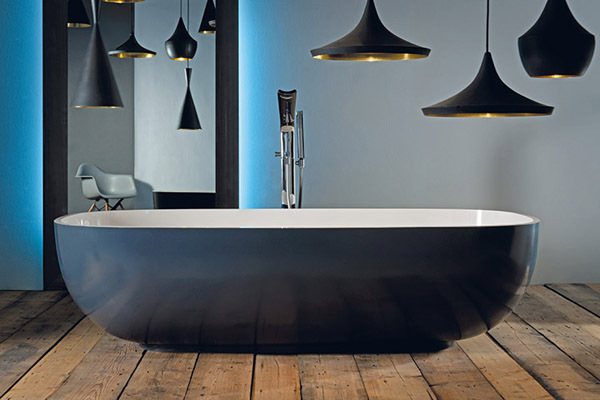 I loved this Olympia freestanding bath. Handcast from a composite stone compound it had a wonderful finish. There's a charming short video on the PP Mobler website in which Hans Wegner describes how he came up with the idea for this chair (you can view it here). Whilst at the beach one afternoon watching his children play, Wegner dug himself into the sand and tried to find a position that was comfortable in order to enjoy the holidays. When he returned to his studio he made a chair that shared those proportions as much as possible. It's made from stainless steel and specially developed flag line and, with the addition of a long haired sheepskin, is the ultimate in relaxation and luxury. I know a spoilt whippet who would just love to sprawl out in one of these. Ligne Roset marked 40 years of Togo with a number of limited edition fabrics and patterns for their iconic sofa - including houndstooth and a floral print velvet jacquard. Their stand proved a popular hang out for show visitors looking to rest their weary feet. As open plan living becomes more popular the kitchen is increasingly a space that needs to be part of a larger integrated area. DOCA plays to this trend by creating kitchen cabinetry that translates effortlessly throughout the rest of the home, blurring the boundaries between kitchen, living and dining areas and seamlessly becoming part of the interior. Milan based duo Alisée Matta and Giovanni Gennari of Nobody & Co introduced their 24 carat gold limited edition Bibliochaise. Dramatically presented inside a black cage along with its sister piece, Gold Bibliopouf, it was one of the stand-out spectacles of the show. Clara von Zweigberk's Kaleido for Hay is a series of trays which, with its modular system, works as a puzzle and urges us to play with it. With nine colours and five geometric shapes the user can build their own designs and colour configurations. Thonet exhibited their 330 chair series by Julia Laufer and Marcus Keichel, first shown at IMM Cologne 2013. The inspiration for the series was derived from the ambience of artists' studios, theatre stages and literary cafes - spaces where idealistic values play the main role and where there are usually only a few simple and beautiful objects on display. Poggenpohl, who launched a new luxury matt finish for their cabinets, shown above with porcelain worktops, very kindly hosted the Modenus Global Design Blogger 'meet up', linking bloggers at the May Design Series with blogging friends at the International Contemporary Furniture Fair in New York. There were a few technical hitches with the transatlantic link up on the night but we enjoyed hearing Will from Bright Bazaar choosing his highlights from the show and were treated to the fantastic hospitality of Poggenpohl, so a big thank you to them. I'd like to thank Thonet for the lovely book they gave me on the history of the company and its iconic designs. And finally I'd like to thank the organisers of the May Design Series for inviting Design Hunter to be a media partner for the event. It was a fantastic show and I'm already looking forward to the next one. The May Design Series will be back next year from 18-20 May 2014.